So, I'm 17 and have had acne for several years (still do). It used to be just on my face and forehead but that went away for the most part and it began taking over my neck, chest and back a few years ago. I have just recently started trying to get rid of it as it's quite embarassing to me. I have tried several different treatments and it seems a little better but I'm not quite sure what kind of acne I have. The weird thing is I tried an over the counter neutrogena body wash and it gave me acne on my arms and stomach where I never had it before. Ther aren't really any new pimples there, just same ones that won't go away. The arm and stomach pimples remains even after a few months. None of the topical stuff I've tried has done much but I've seen a small improvement taking daily supplements (Zinc 50mg, vit d3 8000IU, omega 3 900mgx4, acidophilus, vit c) I just started taking psyllium fiber today. I'm not sure what kind of acne I have, is it pityrosporum folliculitis? I've got the same sort of stuff on my chest, back and neck. My forehead acne goes away when I wash my forehead with soap daily. 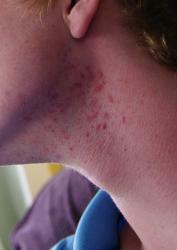 I have very similar neck acne.. drives me nuts.. ahve you found anything that works? Your chest looks similar to mine. I've found that tanning works well but only for the short term. Have you been to a Doc/Derm about this? 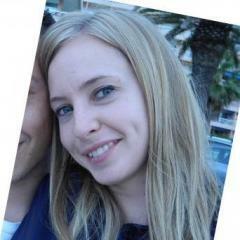 Interests: Yoga, Ayurveda, Tea, Cooking, Reading, Running. I don't know what specific kind of acne that is, but I do know that because of the location it's hormonal. If you're still going through puberty it will go away once your hormones have balanced. Hey! My boyfriend gets the same type of acne/irritated skin around his jawline sometimes, and he says it's from shaving. He has glowing smooth skin everywhere else. This is honestly what it looks like to me...ingrown hairs and what not. I don't want to minimize the acne on your neck/jawline, but those don't look like cysts to me. It could be hormonal too. We make our acne much worse by picking it and irritating it with all sorts of scrubs and washes. I believe that so many acne ads really make one's skin worse! They only want your money. This is what I've recommended to everyone on this site who has body acne. I did all these experiments for a year, and have found what has cleared my body acne. I've had it since I was 11. 1. Throw away all washrags, scrubbers, shower scrubbers, body washes or anything that will "exfoliate" your skin. Honestly all it's doing is irritating your skin. Your skin retaliates from begin irritated and breaks out. I only use papaya soap on my body, which definitely helps with red marks and has really smoothed my skin. I avoid soaps with sodium lauryl sulfate in it. That SLS really irritates my skin. 2. Look at the shampoo you're using. Head and shoulders may be nice, but it still has SLS. I would recomment Aveda scalp benefits shampoo. I don't know where you live or if it's accessible to you. But this shampoo has also helped clearing my body acne completely. I've been using it for a year now, and once I used another a knock off brand of head and shoulders, and broke out in huge zits all over my neck, jawline, scalp, and back. I buy the huge bottle and it's expensive, but it lasts me about 10 months. It's totally worth it to me to have clear skin. If you can't afford this, I would look into a sulfate free shampoo...but be ware...not every "organic" or all natural shampoo is equal. 3. Stop washing your clothes, towels, and sheets in detergent. Again, all those soaps have these unnecessary fragrances and perfumes that will irritate acne-prone skin. Sometimes, the detergent never dissolves and actually stays on your clothes. I only wash my clothes, towels, and sheets in hot/warm water with a little bit of liquid soap (wisk). Periodically I've broken out on my back, and realized my sister would leave those bounce dryer sheets in the dryer...! The fragrance from those broke me out. 4. Be patient...it takes time to heal. There will be ups and downs. I hope that you can begin to make these simple changes. I had acne on my body much much worse than you...I had painful deep cysts everywhere. :-/ Oh btw, I don't use any topicals on my body. 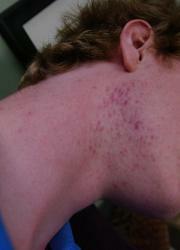 I however use finacea on my face and neck, which if you look at my blog and pictures you'll see my results with it. Best of luck to you bro. Feel free to message me or give us an update! Go out in the sun, an hour a day. Or supplement with 10,000 IU vitamin D-3 daily. Not sure about the chest, but the neck looks like irritation from shaving. I used to get that a little bit. Using a gentle exfoliant to loosen the hairs before you shave helps. Also applying an astringent like witch hazel after you have shaved has helped prevent this in the past for me, you might want to check into that. Also emu oil is great for irritation as well. Also after you shave, whether you are using an electric or manual razor, rinse your face thoroughly with cool water. This helps to calm redness and prevent irritation. I get the same type of spots on the neck/jawline when I wet shave with a razor because I'm just starting and I do it pretty badly. So I would go with ingrown hairs or shaving.